How do you unblock a drain with baking soda? It is also a useful tool to use if you are going away for a holiday or a weekend getaway. The last thing you want when you return home from a trip is drains that smell bad, but there are ways you can avoid this. As a preventative measure you can pour baking soda and vinegar down the drains before you leave. Leave this mixture to work its magic while you’re away, and you’ll come home to drains that are ready to be cleaned. Once you come home, flush the mixture away with boiling water to flush away any residue that may have come loose as a result of the baking soda. Using this step ensures that you won’t have to come home to drains that have become clogged and are starting to smell bad, which can ease the stress that is often experienced when you return from a long trip. Baking soda is a cheap and efficient method to use at home. It is environmentally friendly, and means you are not exposing your drains to any harsh chemicals. 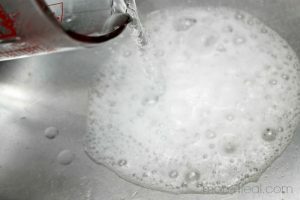 Many drain cleaners contain chemicals such as sodium hydroxide. These chemicals are corrosive, and can burn your eyes and skin, as well as being a respiratory irritant. Using these chemicals on a long-term basis can lead to serious chronic health problems as a result of the exposure in the air. Baking soda is a great way to avoid these health risks. Using this method also won’t break the bank, and it is a great way to use up any baking soda lying around that would otherwise go unused, which can save you money on buying expensive drain cleaners. Using baking soda also won’t affect any household members that are particularly sensitive to harsh odors. This is especially important in households with children, where baking soda is a much better solution to avoid risking any child coming into contact with dangerous chemicals. Did that work? If not, you may have a more serious blockage that requires immediate attention. Call Blocked Drain Bristol now – we’d be happy to help.